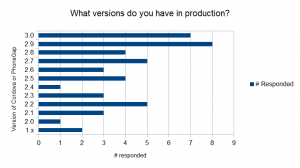 PhoneGap Usage Survey Results | Dan Moore! A few weeks ago, I asked the PhoneGap google group members to fill out a simple usage survey. 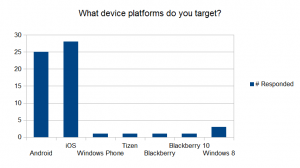 I was interested in versions of Cordova/PhoneGap used, as well as what device platforms were targeted. I had 30 responses over just under two weeks. Note that this survey closed on the 29th, before Cordova 3.1 was released. 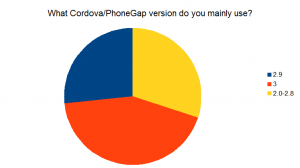 “What version of Cordova/PhoneGap do you mainly use?” A solid majority was on a modern version, either 2.9 or 3.0. “What device platforms do you target?” The vast majority of respondents target iOS and, to a slightly lesser extent, Android. There are a smattering of other platforms being targetted. 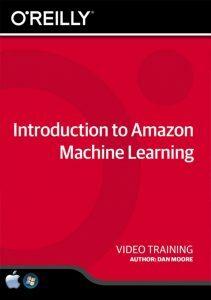 “What versions do you have in production?” Every version of the 2.x line was represented. I think this shows that upgrading PhoneGap/Cordova projects used to be a pain (and, once an app is finished, there often times is no need to revisit). 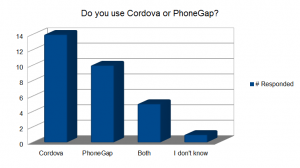 “Do you use Cordova or PhoneGap?” This is interesting to me because I think there is a lot of confusion around the difference. Most people were pretty clear. The results of this survey was interesting to me and I hope to you as well.